The Racetrack is a unique features of Death Valley, known for its moving rocks that leave tell-tale grooves in the slippery mud. They move only occasionally when strong winds combine with a thin layer of water covering the mud playa and transforms it into nature's teflon. Located far from the nearest pavement, there are three ways to reach it by vehicle, none of them easy. The route from the north is often 15mi of some of the worst washboard one can endure. Lippincott Canyon is reputedly one of the more difficult 4x4 roads in the park. With Tom's jeep wrangler we chose the third option, a roundabout route up and over Hunter Mountain and through Hidden Valley before reaching the Racetrack, more than 25mi one-way. We picked the route because there were several P1Ks I was interested in along the way. But first up was a visit to the Racetrack itself which none of us had previously visited. We were up well before sunrise in order to get a start on the long drive and allow us a full day's worth of peakbagging. Going over Hunter Mountain in the dark, we encountered a good deal more snow than we expected, most of it hard and crunchy, offering good traction. This would change later upon our return when we found a good deal of mud in the mix. There were some large puddles of muddy water, partly iced over, that we drove through, some faster than we probably should have which resulted in mud caking just above every side of the jeep, including the windows. At the north end of Hidden Valley we passed through Lost Burro Gap where we had our first sighting of other humans since the previous evening. A small group were camped off the road at one of the small turnouts in the wash. Dropping into Racetrack Valley, it was 7a when we reached Teakettle Junction, notable for the large number of teakettles the sign has collected over the years (there is a similar Crankshaft Junction elsewhere in the park). A second group was camped for the night here where our route meets the washboarded road coming in from the north. We were the only vehicle at the Racetrack when we arrived at 7:15a. The sun was trying to come out, having illuminated Ubehebe Peak ever so briefly before hiding behind some clouds. The Racetrack was calm and cold in the morning, the surface completely dry and safe for walking. Visitors are asked not to walk on it when wet or muddy because the tracks can last for years. We found little evidence of moving rocks but we did note a number of vehicle tracks from a few that couldn't resist the urge to drive on it. We walked across to The Grandstand, a rock formation found at the north end of the playa. The highest point makes for a class 3 slab climb of some interest, but Tom and Karl declined to join me. We searched out the area for the famous rocks ( a sign at the parking lot explains that most of these are found at the southern end which we didn't visit). Tom found the best example on the northwest side of The Grandstand which we duly photographed. 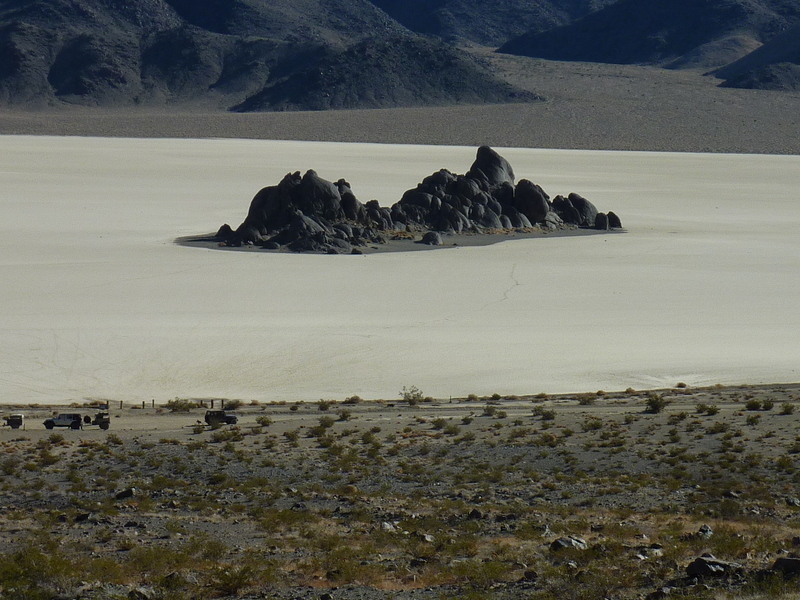 It was really too cold to enjoy further exploration around the playa so we turned our attention to Ubehebe. Ubehebe is a P1K overlooking the Racetrack on its western edge. It had been on my radar for a number of years and was the primary objective of the day's efforts. The moon was poised just over the summit as we geared up back at the jeep and set out on the trail starting from the parking lot shortly before 8a. There is no official sign and the trail does not appear on park maps, but it seems someone (or group) has put in a good deal of time and effort on the first two miles of this three mile trail. It's not the shortest route to the summit and may not even be the fastest as it takes its time to reach the main crest well north of both the highpoint and its lower north summit. Still, we followed it dutifully because it was the easiest thing to do, and it allows one more time to take in the scenic views of the surrounding area. Reaching the crest, we turned left and followed the continuing trail up and around the west side of Ubehebe North. Somewhere in here the good trail devolves to something more like a use trail, but still plenty good to follow to the summit without exceeding class 2 in difficulty. After reaching the top in about an hour and a quarter, I continued south along the crest to investigate descending that way. It didn't appear to have any real trouble to contend with. Tom had already arrived before I had returned to the highpoint and Karl was not long in joining us. We took a short break for a snack and rest before heading back down. I decided not to try the more adventurous route off the south side mostly so I could pay a visit to the north summit on the return, making for an easy bonus peak. Tom and Karl joined me on this one as well before we all returned to the trail and back down to the Racetrack. A small 4x4 group had arrived at the parking area sometime during our hike. The guys were busy securing cargo to their vehicles and trailers or else seeming to look busy while a few children as young as 3-4yrs went scurrying about while Moms looked on. We piled back into the jeep and headed out, leaving the Racetrack to the other group. There is another, unnamed P1K a few miles north of Ubehebe, but we left this one for another time. I guessed (correctly, for once) that we'd not have enough time for all the P1Ks I'd planned on, and this seemed best to leave for another trip driving down from the north. Between Racetrack Valley and Hidden Valley is a north-south ridgeline whose highpoint is found at the north end, above the Lost Burro Mine. We drove back through Teakettle Junction and into Hidden Valley, utilizing a good side road that goes to the abandoned mine site. We parked off the road in the drainage between the mine and our summit. Though there is no trail, the hike is an easy one, less than 3/4mi from where we started. We climbed the steep, sandy slope to the South Ridge and followed up from there to the highpoint over one false summit, taking 30min. We found a 1991 register left by Barbara and Gordon with about 16 pages of entries over the intervening 23 years. Many of the usual suspects had visited including Bob Sumner, John Vitz, Steve and Shane Smith, Terry Flood, Sue and Vic Henney, Mark Adrian & Richard Carey and others. Thus is the draw for a summit with more than 1,000ft of prominence. At Tom's suggestion, our descent route took us down to a saddle west of the summit and from there south down a gully leading back to our car. Neither much harder or easier than the original route, it made for a nice alternate. Near the end we came upon a tin can graveyard, evidently the dump used when the mine was last active many decades ago. Another side road off the main route through Hidden Valley branches northeast to a mine site north of White Top Mtn. I would have liked to pay a visit to this easy to reach (once you make the somewhat rough 10mi drive) summit, but we were getting short on time. Of more interest was another P1K that can be reached after driving the first 4mi of this route. We parked off the road at a Wilderness boundary sign less than 2mi NW of Leaning Rock BM. We followed a wash upstream around a low hill before starting the mile-long hike across the gently rising desert floor to the base of the mountain. Our route up from there was not particularly inventive nor did it need be as it appears just about any route would work. We followed a ridgeline that connects to the main crest at the very summit, about as direct a route as we could manage. It was 1:40p by the time we reached the summit, having taken an hour in the effort. We found the benchmark but could locate no such rock meeting the description of "leaning". A register left in 1979 by Wes Shelberg had 8 pages of entries, decidedly less than the one on Lost Burro. In addition to some of the same names (Barbara and Gordon for example had paid a visit 4 days after climbing Lost Burro) there were other familiar names such as Kathy Wing and Don Palmer. We followed the same route down, taking more time to examine rocks and admire the views. I picked up a piece of limestone I thought might have been a indian spearpoint but the others were less convinced. I left it where I found it in any case. I picked up other odd bits of rocks to examine them, but once again failed to find that large, dirty nugget of gold that I've probably stepped over dozens of times. It was 2:40p by the time we returned to the jeep.